Ever look back on past New Year’s resolutions and notice they failed, not with a bang, but with a whimper? There was no dramatic quitting of that new class and no midnight burger binge. Instead, time just gets away from us. Other priorities come into our life. We just forget. There’s one type of professional for whom that’s just not a possibility: project managers. By definition, their work depends on time (and resources) not getting away from them. That’s why they’re great role models when it comes to reaching those elusive goals. Ask any project manager to see a plan for something they’re working on, and chances are it won’t just be a piece of paper with a crayon sketch of the finished product. Project managers have to do two important things. The first is to break down that end goal into smaller goals, and then into tasks that will help them achieve those ‘micro’ goals. The second is to put those tasks in order. You might not have a massive spreadsheet or fancy charting software for your resolution but you can break them down into manageable, bite-size chunks. Want to run a half marathon by the end of the year? Build up your distances slowly. Trying to lose weight? Remember, a normal healthy rate of loss is about 0.5kg a week.i Aiming for a promotion at work? Take on one new responsibility at a time and build up your skill base. Even the best laid plans can run into trouble. The best you can do is a) acknowledge potential challenges ahead of time, and b) give yourself room to fail (to a certain extent). Project managers build in contingency plans all the time. Sometimes this is expressed as a margin on the time or budget estimate. Try predicting roadblocks on a task-by-task basis. Say your resolution was to spend more time with your nieces/nephews/grandkids. One problem might be that you’re consistently busy with work. The solution? Instead of waiting ’til you’ve got a clear week or so ahead, book off time in advance. If they’re the ones with busy schedules? See if there’s something you can do together, whether it’s ferrying them to Saturday sports, or a much-needed trip to the shops. When project managers start planning, they make sure they’ve got the right people for each task. And that they’ve got those people for the right time frame. You can do the same. 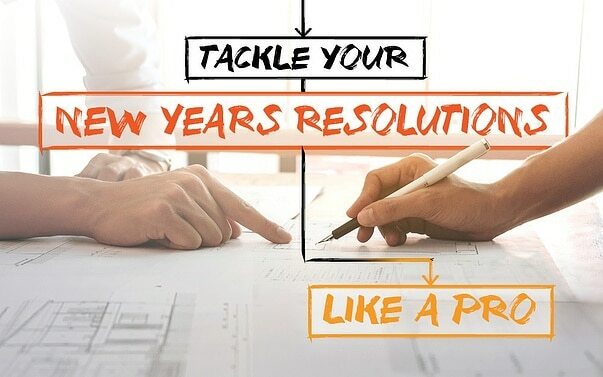 For each resolution, you’ll need a few key people: a cheer squad (or just one person you trust to share your goal with), a mentor, and a subject matter expert. The cheer squad are the ones who’ll help you on a day-to-day basis, encouraging you when you’re feeling tired or low. The mentor is someone who’s successfully achieved your goal already, and can help you get there too. (Hint: this doesn’t have to be a close friend or family member. It could be an acquaintance, or someone from an online community.) The subject matter expert is the professional – doctor, personal trainer, counsellor, financial adviser – who does the big-picture planning with you. Speaking of advisers – we’re here to help you review the financial aspects of your resolutions. And we’ll be here throughout the year to help keep you on track. To discuss your new goals and priorities, get in touch with our office today.